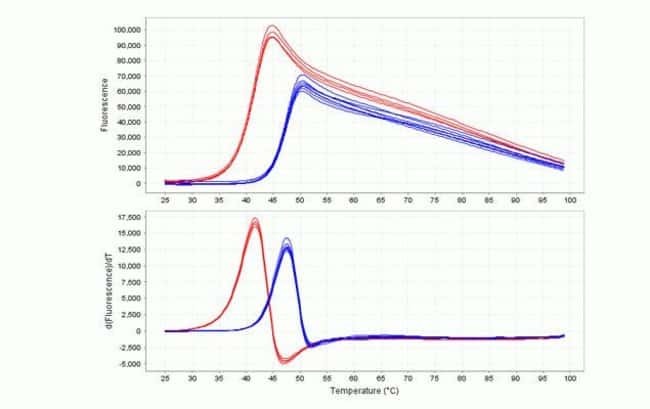 The Protein Thermal Shift™ Software v1.3 was developed to analyze protein melt fluorescent readings directly from Applied Biosystems® real-time PCR instrument files. Different proteins will have different Protein Thermal Shift™ profiles, each with a unique protein melt curve shape, slope, signal-to-noise ratio, and temperature melt range (see figure at right for an example). The Protein Thermal Shift™ Software generates one or multiple melting temperature values (Tm) from these curves by two methods: the Boltzmann-derived Tm and the Derivative Curve-determined Tm, to serve as points of comparison between the curves and represent the relative thermal stability of the protein under different testing conditions.